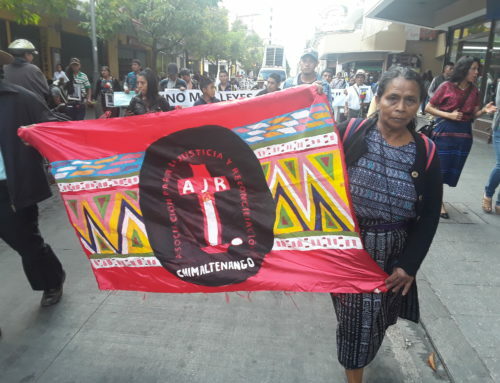 The submission of preliminary evidence in the Molina Theissen trial was expected in Guatemala’s First Instance Tribunal last week but was halted by a defense appeal on the issue of amnesty. The court had previously ruled against amnesty but halted proceedings to await a higher court’s decision. The family members and plaintiffs in the case expressed concern about the suspension of proceedings as the court awaits a ruling, stating it is a violation of due process that may threaten the advancement of the case. 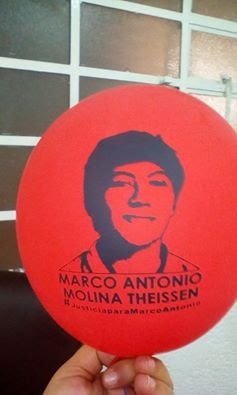 Four former military officers are facing charges related to the 1981 forced disappearance of 14-year-old Marco Antonio Molina Theissen, including Manuel Callejas Callejas, former head of military intelligence under dictator Romeo Lucas García. 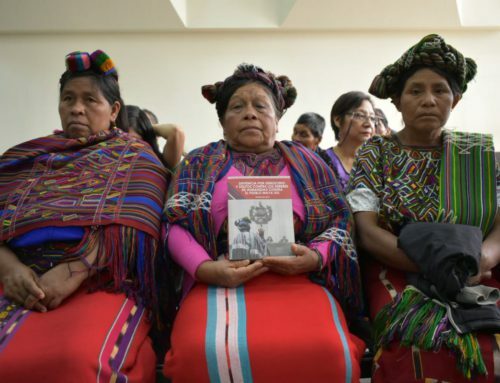 This case joins other emblematic cases of justice for crimes committed during Guatemala’s internal armed conflict and is of special significance in its prosecution of the disappearance of a child. 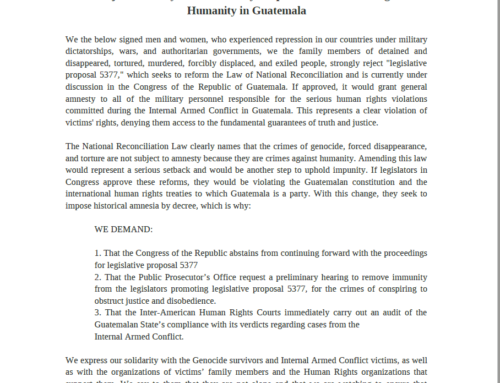 The amnesty appeal was filed by Edilberto Letona Linares, the second-in-command at the Quetzaltenango base at the time, who is also indicted on charges related to Molina Theissen’s disappearance. Despite the fact that the Amnesty Law is not applicable for crimes against humanity and having previously rejected that motion in her own courtroom, Judge Judith Secaida decided to suspend the trial to await a resolution of the appeal, causing concern amongst plaintiffs and human rights groups. This now-familiar stall tactic is commonly used by former military as part of their defense strategy even though multiple courts – including the Constitutional Court – have ruled that Amnesty is not applicable in these cases. After spending 34 years searching for the whereabouts of her son and information on his disappearance, Emma Molina Theissen is representing the family as a plaintiff in the case. Just over a week before Marco Antonio was disappeared in 1981, his sister Emma Guadalupe was illegally detained and taken to a military base in Quetzaltenango. After being tortured and repeatedly raped over the course of a week, she managed to escape through a window. Soldiers arrived at the family home in Guatemala City the next day, where they grabbed Marco Antonio, taped his mouth shut and took him away in the back of a pickup, beating his mother when she tried to intervene. Though she ran after the truck, his mother was unable to stop them; she was never to see her son again. 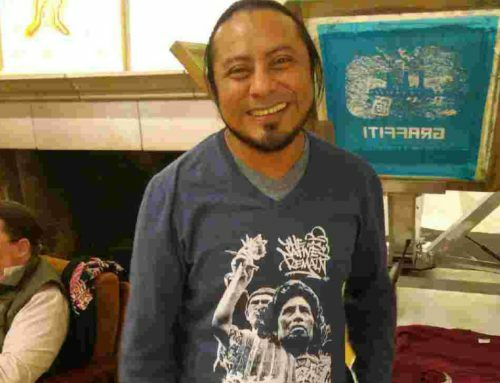 Marco Antonio’s family spent years trying to find him, looking in hospitals and military bases and asking the church, the authorities, human rights organizations and the military to help them find him. They were unsuccessful; indeed, one uncle was beaten to death for going to the military base to ask after the boy’s whereabouts. 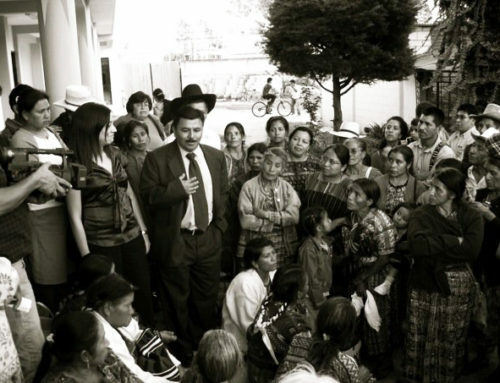 Eventually, the family took the case for forced disappearance to the Inter-American Court of Human Rights and in 2004 the Court found the Guatemalan state responsible for Marco Antonio’s disappearance. It took until January 2016 for the case to gain traction in Guatemalan courts when the four former military officers were arrested in conjunction with his disappearance, on the same day that 14 other former military officers were arrested on similar charges based on evidence uncovered at the CREOMPAZ military base. Eleven of the 14 arrested were indicted and await the evidentiary hearing scheduled for May 3. Read more information about the CREOMPAZ case here. Marco Antonio’s sister Lucrecia documents the ongoing pain wrought by the loss of her brother in her blog, Letters to Marco Antonio, where she documents Marco Antonio’s story and the search for justice. She writes, “When I am in front of them [the accused], face to face, you will be with me in my skin, in my veins, in my sight, in my words and in my tears, giving me strength to speak on your behalf and on behalf of so many who cannot.” She has called on the international and national community to stand in solidarity with the family and all of the other families who continue to seek information about the whereabouts of their disappeared relatives. NISGUA is partnering with the Center for Human Rights Legal Action (CALDH) to provide ongoing coverage of this case as they support the Molina Theissen family. 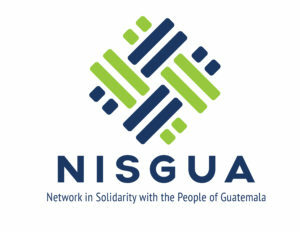 Follow NISGUA_Guate on Twitter and regularly check our blog for updates on this others emblematic cases prosecuting crimes of the internal armed conflict.